Are you watching “13 Reasons Why” on Netflix? I just finished watching the drama and found it to be an emotionally raw and likely realistic depiction of teenage life today. So here are Dr. Carrie’s..
1. Should I watch this? I think so. This series was well done and a good portrayal of the significant issues our kids face in high school. If you are a parent with a child in or entering this age group, you may find this scary to watch, but It is important to know the realities of what your child is facing. 2. Should my kids watch this? As a pediatrician, parent and tween educator I would advise proceeding with caution. After watching this show I would say FOR CERTAIN, that any parent who is thinking about allowing their pre teen or teen to watch this show should watch it in its entirety first. This allows you to make an informed decision about whether its content is appropriate. Making the book “required reading” prior to watching the series is also a good idea. For a younger child, they are only able to interpret events based on what they have experienced in the past, and I would think that the written interpretation in your teens head of some of the most disturbing scenes would be more appropriate than what was shown on TV. Common sense media rates this show appropriate for kids 16 years and older. 3. Teens are emotional beings that are not yet wired to handle their emotions. Our brains develop from the inside out and from the back to front. That means that a deep part of the brain, called the limbic system, in teens comes online very early. The limbic system is huge in both size and importance when it comes to emotions (no surprise to parents!). The “yin” to the limbic system’s “yang” is the frontal lobe, also known as the executive center of the brain. The issue in teens is that although though they have a frontal lobe, it is actually not completely wired until age 25! This sets up a situation where there is an emotional megaphone shouting from a teens brain, but there is no way to muffle it. 4. The signs of depression are hard to recognize if you aren’t looking for them. Sometimes it is difficult to connect with our teens, especially if they are intentionally trying to shut us out. Here are some of the tell tale signs of depression that you can LOOK for in your teen. 5. The most important time to be aware of your surroundings is also the most likely time for a teen to be impaired. I was most struck by the party scenes in this movie. Being a teen is hard even when you are at your best. The issue is that the time when teens get into the most trouble is outside of school when they are most likely to find substances that impair their judgement. Unfortunately, this sets up a perfect storm and puts a teen at risk. Whether it is getting in a car with someone who has been drinking or finding themselves alone with a boy that they don’t know very well, teens do not have the forethought to think a couple of steps ahead. They also do not have the life experience to navigate their way out of a tough situations. Start teaching your children at a young age about “gut feelings” and that if they feel a sense of danger or hesitancy, it is ok to change their course. Those feelings are there to protect them. Remind them of this often. 6. Doing the right thing is hard. Each of the teens in the show struggled at different times with doing the right thing. So did the adults. The reality is that we tend to oversimplify life sometimes when we talk about it to our kids. What would have happened if Hannah made herself known when she was in the room with Jess and Bryce? How would things have been different if Hannah called the police at the scene of the accident? Neither of those things would be easy to do, but they could have changed the course of the series of events. Doing the right thing is often difficult. 7. There are real consequences for our actions. This is the real lesson of the whole series. All of the actions of this group of teens had intended and unintended consequences. Teens do not own up to their mistakes readily, especially when they fear “getting in trouble”. Teens need to understand the real consequences of their actions can be far worse than “getting in trouble” with their parents or school, and this is the reason behind the rules that we have. 8. Teens ask for help in funny ways. At the end of the series, Hannah was reaching out to see if anyone would hand her the lifeline that she was desperately looking for. I was particularly saddened by her interaction with her counselor, who was unable to connect with Hannah in the way she needed. Teens may not be able to properly articulate how they are feeling, because their emotions are complex and they may feel completely exposed. If a teen reaches out to connect with a counselor, parent or mentor, even if they do not DIRECTLY ask for help, they may be needing it. 9. Social media makes adolescence more difficult. When we were young, passing notes in class could spread rumors, but most likely at some point, someone would get caught red handed. Now a picture can be snapped and be seen by everyone WITHIN SECONDS. Considering that teens are impulsive and lack the part of the brain that puts the brakes on this impulsivity, a firestorm can erupt quickly. If we remind our kids to “think before they speak”, we certainly should remind them to “think before they post”. Consider implementing a rule that there needs to be a time delay between taking a picture and posting it. 10. Remind your kids that it gets better. Sometimes it is hard to remember being a teen, or maybe adolescence was so tough that we suppress some of the memories. But remember, you were in their shoes once and came out on the other side. Share your stories with your teen-tell them that the feelings of loneliness are temporary, and you felt them too. Remind them that it takes time to figure out who you are, and life can slap you in the face more than once. Don’t sugar coat it-life is hard, but I think we can all agree that it gets better after high school. 11. Finding your people is crucial for teens. Hannah felt progressively more isolated as the show went on. As adults, we tend to forget how important your social circle is when you are a teen. It is your lifeline. Adolescence by definition is the time when teens transition from being a child to being an adult, and that requires them separating from their parents. Parents are replaced by friends and without this, a myriad of consequences ensue. Teens don’t need a lot of friends, but they do need 1 or 2 people who are by their side. Did Hannah’s parents fail to recognize her depression? Did they reveal too much regarding their marriage and their finances? Did they not take time to connect with her or did she push them away? We don’t know all the answers to these questions. But what I can say definitely is PARENTING IS HARD. It’s exhausting, demanding and humbling all at once. It’s a long game and the stakes are high. It is a guarantee that you will make mistakes as a parent.. As a parent, we must be resilient and be able to handle rejection because our kids will push us away, beat us down and then come right back to us the minute they feel scared or unsafe. That is just part of the job. The process of transition from childhood to adulthood is full of challenges and learning opportunities. There are so many pressures – from social pressures to parental expectations – and we expect teens to handle it all with a smile. 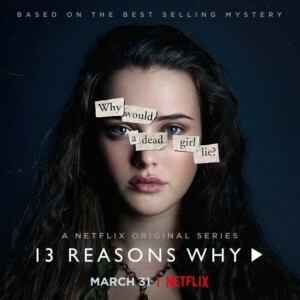 “13 Reasons Why” gives us a window into the challenges of teen life that we may not have with our own kids. While the players and situations may differ slightly, the overall themes are present in most high schools and for most teens making this series a “must watch” for parents.